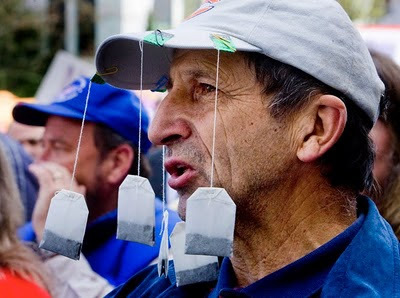 Back in 2009, a slightly silly show of faux patriotism, variously known as the tea baggers or the tea party, burst onto the scene in the form of spontaneous demonstrations across the nation attended by dozens of people draping tea bags from their hats. It started as a reaction to Barack Obama's stimulus proposal. 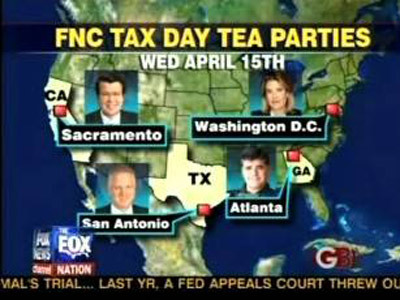 Then a combination of AstroTurf groups -- which underwrite fake grassroots movements -- like FreedomWorks and Americans for Prosperity, coupled with brazen propagandizing by Fox News, which continuously mischaracterized the tea partiers as a grassroots populist movement while publicizing and then covering every tea party event as if it were a really important political development, drove the movement deep into the political consciousness of the electorate. Let's just forget about the Bush deficits now that Obama's here. What must be understood is that it was always a phony movement, always. That doesn't mean that the spasms of populism, driven by angst that Obama was somehow different -- hint, he wasn't, except that he was black -- weren't real. They were. What's important to realize was that they weren't tea-party spasms of populism: They were the Republican Party violently overreacting to Barack Obama's election and lurching in a far-right direction and spread with the help of moneyed interests. It's also important to realize that the powers that be in the corporate world were using this conservative angst and fear of the black to thwart Obama's efforts to reform health care, which the business interests feared would reduce their profits. Also, people like the Koch brothers, who underwrite Americans for Prosperity, feared the loss of profits from Obama's support for green energy. Now, it may be convenient, especially for the media, to continue to refer to this far-right element of the GOP as the tea party, but what it really represents is the conservative core of the Republican Party that has gone off the rails, politically speaking. And this has had powerful ramifications for the country. What's there to talk about exactly? How so? This conservative core has become so reactionary that the Republican Party cannot participate in effectively governing this country. This in most evident in the remaining bastion of their power, the House of Representatives. We've had political movements like this in the past. The McCarthy era was a Republican-Party spasm that wrecked careers and stymied creativity both in the entertainment industry and government. The John Birch Society was an anti-communist movement in the 1960s that drove the arms race with the Soviets. I've always felt that the cold war was an unnecessary enterprise that led to a tremendous loss in blood and treasure, especially because of Vietnam and the ridiculous build-up of atomic weapons. We built thousands of them. Did we ever use them? Will we ever? What happens now is anyone's guess. But remember this: the Republican Party is the tea party, and the Republicans are no longer a valid force in government. They don't give a damn about deficits. They only want to use deficit fears to cut taxes on the rich (how does that make sense, exactly?) and shrink the social safety net, mostly because they hate, and I do mean hate, the poor. But mostly, well, taxes. 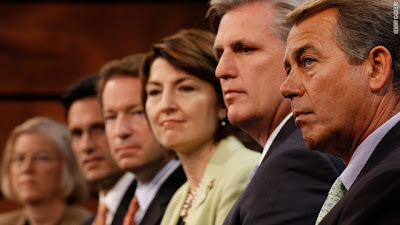 The rudderless Republicans may do damage before they fix their own mess. They may even survive. But they will not be offering solutions for the near term. They will only be throwing bombs, many of which will land in their own camp. 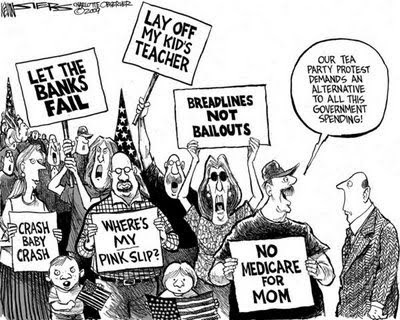 Just don't blame it on the tea party, blame it on today's Republican Party. What tea bags hath wrought: this Republican catastrophe.